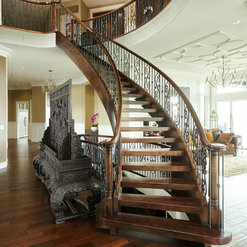 Are you ready to add some wow factor to your stair design project? 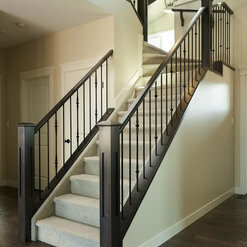 With Custom Newel Posts you get access to beautifully hand crafted newel posts and railing product that will allow your staircase to become the centre of your home. 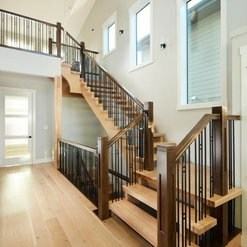 Custom Newel Posts is brought to you by long running Houzz design award winner Specialized Stair & Rail, one of North America’s custom stair builders. Since 1999 we've pushed the boundaries of stair design and now it’s your turn. 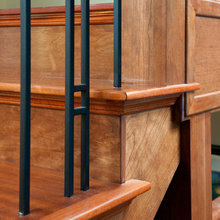 Get beautiful stair posts, spindles & railing right to your door. Explore craftsman, contemporary, modern and traditional styles. 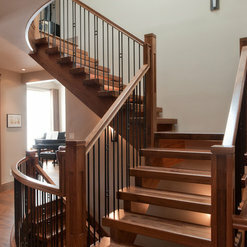 View over 60 stair post designs along with beautifully crafted stair railing profiles and spindles on our website. - Free shipping on orders over $500 - Rugged packaging and fast delivery - Easy online ordering process Be inspired and visit customnewelposts.com! I ordered a natural oak newel post for my main staircase. It arrived quickly, was exactly what I ordered, and was visually flawless. 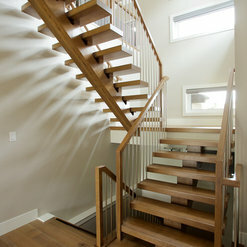 The new stair case part from Custom Newel Posts look great in our fully renovated main floor. We looked at many styles before we found these mission post and metal spindles. I ordered the parts from Custom Newel Posts' on-line store and they were delivered in about 1 week. 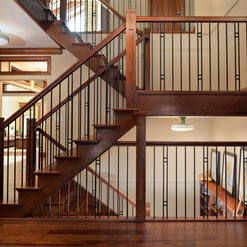 We've received many complements on our new stair case. It is a great blend of traditional style with a modern flare. Custom Newel Posts has been awesome to work with. We have used their products on three projects so far. Their design/style options are very sleek and modern, unlike anything available from the traditional vendor we have worked with in the past. The unique style makes it an easy scope add on for larger projects. Ordering is a breeze and shipping is very reasonable. In terms of quality the products come packaged very well and have experienced zero or damaged product. Install is also straight forward. Their customer service has also been top notch as they have reached out several times to make sure we are satisfied with every order!!! Custom Newel Posts did an amazing job of creating the most beautiful walnut newel posts, handrail and show. Their quality and pricing are great! We look forward to more custom stair parts on future jobs. Thanks so much! Thanks for the review! We really enjoy working with Chatwin Homes. 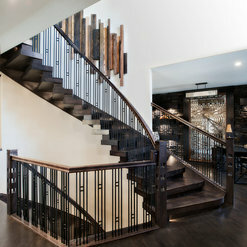 Your team creates stunning homes, we love being a part of your staircases. Great product. Shipping was easy, materials were solid and beautiful. Install was simple with all aspects of the posts and railing. Thanks for the review, that is our goal with Custom Newel Posts - getting customers quality railing products with ease! We love our balusters. Truly the look that my wife and I were looking for. We installed them in our cabin in Northern MN. and have received may comments. Custom Newel posts was very easy to work with and the balusters arrived quickly with no shipping damage. Our stairway to the loft is surly one of the highlights of our cabin! They’re the only place that my wife could find what she wanted, their website was easy to navigate. Customer service swas spot on and the product is a five star. We will only consider them for all of our future needs. To have someone custom make these would’ve been three times as much cost. Thanks for the review! I'm so happy you found exactly what you were looking for! We ordered handrail and newel posts for the house we recently built. The product was very high quality, of great design and easy to work with. True craftsmanship. The added care that went into packaging the materials was excellent and everything arrived without a scratch. Thanks for the review and taking the time to post pictures. 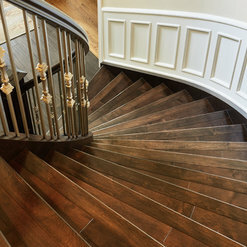 We love to see how customers combine our products to create beautiful stairs. The construction and quality of the Mission newel posts and Gibson hand rail is superb. Many attractive options were available, with multiple species of wood. Shipping time and cost was reasonable, as well. I am absolutely delighted with the purchase, and will definitely consider Custom Newel Posts again. Thanks so much for taking the time to share your experience! Purchased six full and two half quarter sawn white oak newel posts, approximately thirty feet of matching handrail, twenty seven decorative black iron balusters and thirty five plain black balusters. 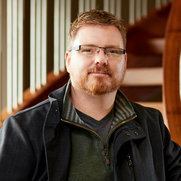 I was very impressed with the quality and craftsmanship of all the products. Also, all items were extremely well packed for shipping and had absolutely no damage to any piece. I’d definitely buy from this company again for the reason above but also for the uniqueness of their products. 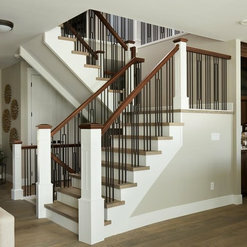 Their products are originals unlike most other stair part suppliers. I spent over four grand USD with them and definitely feel I got my money’s worth. My stairway turned out beautiful and gets many compliments from everyone who visits. Thanks for taking the time to write a review. 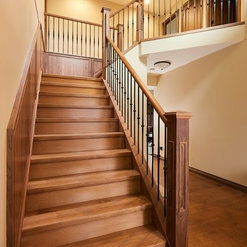 I am so glad we could help bring your beautiful staircase together! Purchase all of my stair parts for my new Home from Custom Newel Post. Website was easy to navigate and product selection was outstanding. Everything that i ordered showed up correct and on time. Will be using them again on some upcoming projects. Hi Hank! It was a pleasure working with you. Thanks for the review. If you have concerns about ordering stair parts online...worry no more. This is the "go to" company for stair parts. Helpful, knowledgeable, its like everyone that works there has pride of ownership. Great experience! I sought advice on my initial order, made the order, received it in less than 2 weeks and the parts were packaged more than adequately. Good prices, free shipping with a great vibe! Hi Mike! Thanks so much for the review. We really enjoyed making the Sparrow Newel Post for you. Such a unique design.